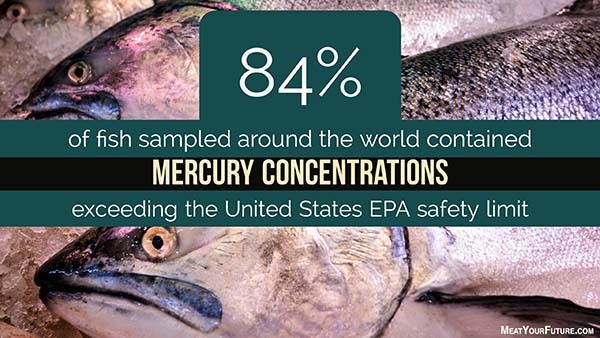 84% of fish sampled around the world in 2013 contained MERCURY CONCENTRATIONS EXCEEDING the U.S. EPA safety limit. And, according to the United Nations, mercury emissions are continuing to increase on a global scale. Mercury is a neurotoxin that can be damaging for the central nervous system and several other systems depending on where it accumulates (for example, if it accumulates in heart tissue, it can cause conduction problems there). Mercury can also cross the placenta and cause damage to an unborn fetus. Although people usually think of fish as a health food, fish are highly contaminated and unregulated, and often contain other chemicals like DDT and dioxin as well. This is easily avoided with a plant-based, vegan diet. You can get all the protein you need from plant-based diets, without all of the problematic aspects of animal foods. You will also be withdrawing your demand from an industry that is causing environmental devastation on a massive scale to our oceans and inflicting needless suffering upon trillions of marine animals each year, including dolphins and sea turtles. Our video, “Inky the Octopus“, which further discusses issues associated with our consumption of aquatic animals.